Communication is complicated. So also for the various cells in our body. How could such completely different cells as neurons and let us say bonecells, or highly undifferentiated mesenchymatic cells "talk" to each other? What kind of language can they possibly use? At the Center for Models of Life they talk about decision taking. One guru in this scientific area is Candice Pert. Her "Molecules of emotion" had a profound impact on me. She described this communication as a singing process, and the main media are peptides. She describes the cellmembrane as a veritable forest. The cell is communicating using frequensies, and a healthy cell use harmonious frequencies. What is harmony in this sense? Of course fractality. Looks like our body is fractal in every possible way? Structurally and functionally. We are used to think of this "talk" in terms of nerves and hormones. Nerves "talk" by a chemical impulse, have we learned. But how this impulse can "tell" the information to its surroundings is still a mystery. In an impulse the only thing that is propagated is "noise". The neuron itself doesn´t change (but the synaptic/dendritic ends do change = LTP), or let us say the cellmembrane doesn´t change. The wave carry the information only, as a disturbance or noise. How can this information be encoded? Different frequencies? Perhaps we can compare to a computer lightfiber transfer? The nerve pulse is frequential, not chemical. But how on earth do the synaptic endings know what kind of neurotransmitters to release, and how much, and when? Like all other cells the neurones have just one nucleus for proteine synthesis, or for making copies of DNA in form of single-helical mRNA. Just how is this mRNA transported to the synaptic bouton, which can be a very long distance, and exactly what regulate the proteine synthesis? Today we have very few answers to these questions. One kind of answer is that the nerve impulse is in reality sound. This is explained by the alternative soliton-impulse theory proposed by Thomas Heimburg and collaborators at Niels Bohr Institute in Copenhagen. A density-pulse of different phases in the cellmembrane. During the pulse the membrane"halves" (lipidsheats) widens a little, but no increased heat is observed. On the countrary the membrane is cooled. Something is not what it should be here. Heimburg suggest we have ended up with the wrong theory for the nerve pulse. The impulse is sound, and a quantal one, using Josephson-currents and phase-transitions. The membrane biophysics group writes: "During the action potential in nerves one finds a reversible heat change and mechanical changes. This indicates that the physics underlying the nerve pulse relies on reversible physical processes. We recently explored the possibility that the nerve pulse is in fact a propagating density pulse in the nerve membrane (soliton). Such pulses can propagate close to chain melting transitions in cylindrical membranes. These pulses show many properties that have been experimentally measured, like reversible heat production and thickness changes associated to the nerve pulse. This theory yields a surprisingly simple explanation for anesthesia. It acts as a feezing point depressant for biomembrane transitions and renders nerve pulse generation more difficult." This however explaines no more than the old theory of Hodgkin & Huxley about the functions of synaptic boutons. On the countrary we also gets the mysteries with proteines in the cell membrane, and the real functionings of receptors in the membrane. With the solitonic explanation there is no need for a lot of energy. What is the energy used for? Why so much mitochondrions in axones? The role of free radicals? How do the myelin work? What is the role of membrane receptors? How do they transfer their information? And how do the cells discriminate among all songs, shoutings and screams from all the different boutons (synchronization and organization)? This all points to a very strong electromagnetic function among receptores, neurotransmitters and other signal transduction matters as protons, electrons and calciumions. Temperature, pH, and mechanical force among other factors interfere with the solitone. Topology is a word of honor. The relationship between the regulatory design and the functionality of molecular networks is a key issue in biology, says Axelsen. Rewiring of regulatory links plays a bigger role than genes. Many feed-forward loops works in transcription networks. Cells carry information handed down from their ancestors and are able to pass on information to their descendants. In many cases this ``memory" is epigenetic -- not stored in the DNA sequence -- allowing cells with identical DNA to maintain distinct properties. Epigenetic cell memory implies alternative states that are stable over time and are inherited through cell division. Mechanism for epigenetic cell memory invokes positive feedback loops, either on genes with mutual repression or, for eucaryotes, through recruited modifications of DNA bound nucleosomes. Thus, positive-feedback loops in nucleosome modification can, in theory, provide not only a mechanism for long-term epigenetic memory (Dodd), but also a powerful system for controlling the way in which a promoter gene responds to and integrates multiple signals. Skeletal myofibrils spontaneously oscillate when free Ca2+ is low (in resting state), was reported by Ishiwata 1996.. Although this oscillation phenomenon called SPOC is apparently simple, the molecular mechanism seems to be complex. It is regulated by the mechanical strain imposed on actin and myosin; the enzymatic activity (ATPase) of actomyosin complex and the mechanical event (contraction) are thus coupled to each other. Ysuda et.al. 1996. The change of sarcomere lengths in glycerinated skeletal myofibrils oscillated spontaneously with a peak-to-peak amplitude of about 0.5 microns under isotonic conditions in which the external loads were maintained constant. The shortening and yielding of sarcomeres occurred in concert, in contrast to the previously reported conditions (isomeric or auxotonic) under which the myofibrillar tension (connectin, an elastic proteine)is allowed to oscillate. This synchronous SPOC appears to be at a higher level of synchrony than in the organized state of SPOC previously observed under auxotonic conditions. The period of sarcomere length oscillation did not largely depend on external load. The synchronous SPOC implies that there is a mechanism for transmitting information between sarcomeres such that the state of activation of sarcomeres is affected by the state of adjacent sarcomeres. The change of myofibrillar tension is not responsible for the SPOC of each sarcomere but that it affects the level of synchrony of sarcomere oscillations. Declined synchrony is the result of increasing tension. A certain degree of strain is demanded, though. Mechanical strain is also sometimes behind triggerpoints. Triggerpoints are not the same thing as acupuncture points. If we look at the points histochemically we can see this clearly. Triggerpoints are scars in myofibrils, whereas acupoints are distinct anatomical structures. Muscles contract when, in response to a motor nerve signal, calcium is released from storage in the sarcoplasmic reticulum. In the resting muscle, ATP is bound to myosin in a high energy configuration. The myosin cannot however do anything until calcium is released from the sarcoplsamic reticulum. The calcium switch is turned off. Muscle in Rigor Mortis - the actin-myosin unit is locked together and cannot release: The calcium switch has turned on, and has enabled the high energy myosin-ATP to "bind and bend" to the actin with the release of low energy ADP and Phosphate. However that is as far as it goes: there is no more energy currency (ATP) in the muscle cell to drive the myosin cycle of "release and straighten, bind and bend", and the myosin remains stuck fast to the actin molecule. In active muscle - both calcium and ATP are present, and the myosin cycle of "Release and straighten, bind and bend" is in full flight. The myosin is "walking up the actin". Normal muscle has sufficient ATP in the cell and sufficient integrity in its sarcoplasmic reticulum to quickly re-absorb the calcium and turn off the contraction. However, a trigger point zone in a muscle cannot re-absorb the calcium and turn the contraction off: The contraction continues until tension pulls hard enough against the myosin "leg" to stop it at the bending phase of its cycle. Little wonder there is intense activity with build up of lactic acid and molecular damage. Necroses may be the result. A Trigger Point in a Muscle, severe damage at the Sub-cellular and molecular levels has been noted. Microsocpic examination of trigger point sarcomeres reveals signs of damage to actin fibers. Triggerpoints are identified by what is called Travelli's twitch, a small reflexive contraction (motoric) of the muscle. The autonomous nervous system is one part of the trigger. EMG-response is much higher. Triggerpoints are not restricted to the muscles, but can be found in all kind of connective tissues, like scars, fascias, tendons, periosteum, joint capsules... Connective tissue is alpha-helical too, like actin. Muscle force generation has been interpreted traditionally on the basis of the kinetics of crossbridge cycling, i.e. binding of myosin heads to actin and consecutive force generating conformational change of the head. However, several studies have shown that re-distribution of internal strain within myofibrils and muscle fibres may be a key player, particularly, during stretch or relaxation so that force kinetics parameters are strongly affected by sarcomere dynamics, says Telley IA & Denoth J in a rewiev-article 2007. If we only knew why the calcium switch fails to turn off! Actin seems to be the important part (I-band). This amplification of coordinated cross-bridge binding and cycling indicates a mechanism of cooperativity that depends on sarcomere lattice geometry, specifically the ratio and arrangement of myofilaments. Topology is again very important. The most important ion when talking about communication is calcium. A large number of ion channels, enzymes, pumps and binding proteins participate in the generation of intracellular Ca2+ signals and their decoding. Ca2+ signalling takes place in the form of oscillations, waves and sparks. Such Ca2+ signals occur in almost all cells and regulate diverse cell functions. Perturbation of Ca2+ signalling leads to disease. Drugs that act on Ca2+-signalling are commonly used in treatment of several diseases. This Ca-wave also mediate an metabolic wave of insuline and glucose-metabolism (for ATP/GTP?). Other ions as Na and K are also oscillating. It acts as second messenger in the dendritic nerve loop. This is how the nerve pulse message is propagated? The most wellknown Ca2+-canals is activated of depolarization. Glial cells are very active parts of the nerve-pulse. 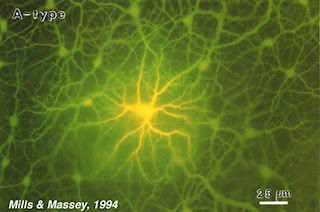 Astrocytes organize synapses. They control neurotransmitter release and free calcium in the synaptic cleft through calciumwaves of their own. And neurotransmitters evoke calcium waves. "The existence of bidirectional signaling between astrocytes and neurons has revealed an important active role of astrocytes in the physiology of the nervous system. As a consequence, there is a new concept of the synaptic physiology-"the tripartite synapse", where astrocytes exchange information with the pre- and postsynaptic elements and participate as dynamic regulatory elements in neurotransmission. The control of the Ca2+ excitability in astrocytes is a key element in this loop of information exchange. The ability of astrocytes to respond to neuronal activity and discriminate between the activity of different synapses, the modulation of the astrocytic cellular excitability by the synaptic activity, and the expression of cellular intrinsic properties indicate that astrocytes are endowed with cellular computational characteristics that process synaptic information. Therefore, we propose that astrocytes can be considered as cellular elements involved in the information processing by the nervous system." Says Perea & Araque 2005. We now get a picture where the actual decision making is done not by neurones but by glial cells. Neurones are simply a tool for glial cells? There is something else that gives orders to our nerves. Pelling et.al. demonstrated that the cell wall of yest, Saccharomyces cerevisiae, exhibits local temperature-dependent nanomechanical motion at characteristic frequencies (0.8 to 1.6 kHz with amplitudes of ~3 nm), and a metabolic inhibitor causes the periodic motion to cease. An calculated activation energy of 58 kJ/mol is consistent with the cell's metabolism involving molecular motors such as kinesin, dynein, and myosin. The magnitude of the forces observed (~10 nN) suggests concerted nanomechanical activity. These examples of biological processes involving concerted motor protein action lend strong support to our conclusion that a metabolically driven nanomechanical process occurs at the yeast cell wall. This process cannot be observed by traditional cytological methods and occurs in cells in their natural state. The observed motion may be part of a communication pathway or pumping mechanism by which the yeast cell supplements the passive diffusion of nutrients and/or drives transport of chemicals across the cell wall. The current experiments were performed on yeast cells because they have a stiff cell wall. Extension of this experiment to mammalian cells will require the use of specially fabricated cantilevers with small spring constants comparable to the spring constant of the mammalian cell membrane (~0.002 N/m). In close connection with the membrane are microtubules (MTs). Also other kinds of tubuli are there. Cytoskeletal elements interact extensively and intimately with cellular membranes. Microtubules are components of the cytoskeleton, the network of proteinaceous fibers that endows the cell with structural integrity, motile properties, and internal organization. MTs play a particularly important role in cell organization: they pull the chromosomes apart at mitosis, act as a ‘railroad system’ for intracellular transport, and define the localization and structure of internal membrane systems. Two characteristics of MTs are particularly significant for these functions. First, MT nucleation is regulated, and the limitation of nucleation to the centrosome endows most cell types with a radial organization. Second, and perhaps more importantly, the MT cytoskeleton is dynamic: individual MTs in the same cell (or same test tube) constantly change in length, either growing or shrinking with random transitions between these phases. This counterintuitive behavior is termed dynamic instability. I would say cellular "brain". First, dynamic instability is a mechanism for exploring cellular space, bringing MT railroads into contact with poorly diffusible cargo, such as chromosomes for subsequent transport, Second, this turnover ensures rapid response of the cytoskeleton to internal and external signals. Selective stabilization of dynamic MTs probably plays a key role in morphogenesis and appears to play a central role in the selforganizing properties of the mitotic spindle. Briefly, tubulin subunits (which are obligate dimers of the polypeptides alpha- and beta-tubulin) bind GTP. Upon polymerization, this GTP is hydrolyzed to GDP, but only after a short delay. This delay is thought to result in a ‘GTP cap’,which predisposes the MT to continued growth. Actin is the monomeric subunit of two types of filaments in cells: microfilaments, one of the three major components of the cytoskeleton, and thin filaments, part of the contractile apparatus in muscle cells. Thus, actin participates in many important cellular processes including muscle contraction, cell motility, cell division and cytokinesis, vesicle and organelle movement, cell signaling, and the establishment and maintenance of cell junctions and cell shape. Many of these processes are mediated by extensive and intimate interactions of actin with cellular membranes. Around 6 nm in diameter, actin filament type is composed of two intertwined actin chains. Microfilaments are most concentrated just beneath the cell membrane, and are responsible for resisting tension and maintaining cellular shape, forming cytoplasmatic protuberances. Endolysosomal tubules in dendritic immunocells are dynamic and display saltatory, bidirectional movement. These tubules have a functional dependence on microtubule tracts and can use polymerizing microtubules. Nanotubules are discussed earlier in this blog. Model of endolysosomal tubules and interdependence with microtubules. Operating speeds of 0.2 to 8 µm s–1 for the myosins and 0.02 to 7 µm s–1 for the microtubule proteins kinesin and dynein have been reported, and many processes taking place inside the cell are mediated by these proteins, with operating speeds 1 to 2 orders of magnitude faster than the individual motor proteins. The force being generated at the cell wall can be determined to a value of 0.2 nN. We can exclude that a single motor protein is driving the observed nanomechanical motion, because the forces observed at the cell wall (~10 nN) are far too large in magnitude. Large-scale forces are generated in yeast cells through the action of many proteins working in a concerted and cooperative manner? The best-studied molecular motors, myosin from skeletal muscle and conventional kinesin from brain, are remarkably similar in structure, yet have very different functions. These differences can be understood in terms of the 'duty ratio', the fraction of the time that a motor is attached to its filament. Differences in duty ratio can explain the diversity of structures, speeds and oligomerization states of members of the large kinesin, myosin and dynein families of motors. Howard J. 1997. Is the subjective I a timelag? Microtubules are the "brain" of the cell. They are doing the computating and desicion taking. And then the cells inform the rest of the body about their desicions through Em-waves, or sound, light etc. The result is then coordinated in waves like EMG, EEG and so on. But there is (always) a "time lag phase" in the pulse, like that "duty ratio" above. Also Benjamin Libet found this delay (350 - 500 msec.). He demonstrated that the readiness potential precedes the time at which participants consciously decide to perform an intentional motor act. Neural activity was preceding the motor response, similar to Libet's experiments; this means the sensory world is experienced delayed with respect to real time. However, this activity was already present prior to stimulus presentation, and thus before participants could decide which button to press. New research has identified networks of brain areas that underlie voluntary action. These areas generate information for forthcoming actions, and also cause the distinctive conscious experience of intending to act and then controlling one's own actions. Automatic motor activation (reflexes) forms an intrinsic part of all behavior, rather than being categorically different from voluntary actions. A crucial issue is how such automatic mechanisms are controlled so that the most appropriate responses are made and unwanted responses inhibited. If we see the subjective I (and perhaps the consciousness in biological way) as a disturbance of the cosmic Em-waves, life itself is indeed very much the same as these oscillations. Incoming oscillation in kHz for Ca, or even in GHz for 1 - 10 mm-waves (the extremely-high-frequency (EHF) band: f = 300 - microwave - to 30 GHz - IR - optical wave). This is then reduced in DNA to UV-band-frequency. And from DNA further reduced in EMG; the bigger the disturbance the bigger value. Eye has one of the biggest frequencies, together with the hearth. They are doing very hard work. Further reduction of the disturbance is seen in EEG, with the highest value, 40 Hz, for incoming disturbances. This is then reduced to alpha-waves about 10 Hz. This can be seen as the ultimate brainwave, and is only slightly above Schumann resonance waves of Earth. Indeed there are also lower frequencies. Josephson oscillate at somewhat above 3 Hz. What is characteristic for these waves? Of course their information-content, or their synchronic and ordered behaviour, their harmony. If these waves are interrupted in the brainstem they are loosing this ordered behaviour and is becoming desynchronized or global. Then the patient is in coma, but not necessarily without consciousness. Rabbit horizontal cell network revealed by dye injections. The dye spreads via the gap junctions linking the horizontal cells to reveal the centrally injected cell and hundreds of neighbouring cells. Plasmatic network and hemichannels syncytia. Coupling seems essential to maintain this oscillatory behaviour, as isolated cells are unable to oscillate. Coupling coefficients and coupling conductances changes dynamically and in phase with the membrane potential oscillations, pointing to an active modulation of the gap junctions. Nanotubes and tunnels are connecting different cells into a cell - cell network through gap junctions. The role of the junctional couplings is to synchronize the oscillations, interfere with the ionic permeabilty and intracellular messages. Emerging evidence suggests that gap junction hemichannels can act as stand-alone functional channels in astrocytes. They can also mediate robust efflux of glutamate, aspartate, and other messages. Also viable proteines can transinfect cells, as in the Rhett syndrome. Chaperones, kinesines, TNFs, cytokines, ILs, PGLs and many, many more signal substances, voltage and metabolites, even oxygen and free radicals, work in intimate connection to this network. It is really question of sick or health states. 'When a "tape" of mRNA passes through the "playing head" of a ribosome, the "notes" produced are amino acids and the pieces of music they make up are proteins.' You get "DNA-songs". Libet B, Gleason CA, Wright EW, Pearl DK. 1983: Time of conscious intention to act in relation to onset of cerebral activity (readiness-potential). The unconscious initiation of a freely voluntary act. Brain. 1983 Sep;106 (Pt 3):623-42. Telley IA, Denoth J. 2007: Sarcomere dynamics during muscular contraction and their implications to muscle function. J Muscle Res Cell Motil. 2007;28(1):89-104. Travell & Simons' Myofascial Pain and Dysfunction: The Trigger Point Manual (2-Volume Set. )David G. Simons (Author), Janet G. Travell (Author), Lois S. Simons (Author), Barbara D. Cummings (Author).